General Anesthesia – medication provided to relieve the sensation of pain. General Dentist – a primary dental care provider for patients in all age groups. Geriatric Dentist – a general dentist who primarily treats senior citizens. Gingiva – the soft tissue surrounding teeth, also known as gums. Gingival Crest – the prominent edge of the gingiva. 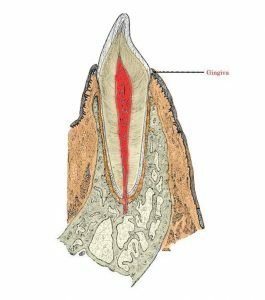 Gingival Hyperplasia – an enlargement of the gingiva, or gums. Gingival Hypertrophy – the abnormal enlargement of the gingiva surrounding teeth, caused by poor oral hygiene or certain medications. Gingivectomy – a dental procedure performed for both cosmetic and health-related purposes. 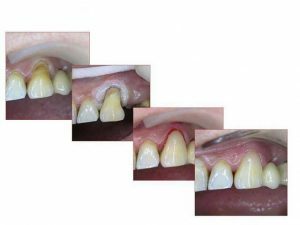 This procedure involves removing some of the gum tissue to achieve a more appealing appearance and make the teeth and gum line easier to clean. Gingivitis – the milder form of periodontal (gum) disease, characterized by inflamed and swollen gum tissue, and most commonly caused by plaque. If left untreated, this disease can progress to periodontitis. Golden Proportion – the guidelines used by dentists in determining the most esthetic appearance of a particular tooth (teeth need to maintain a certain height to width ration in order to look their best), also known as the golden rule of proportion. Groove – a long, narrow depression. Gutta Percha – the predominant material used in filling root canals.